Whoever shows up used the pond. Mosquito dunks and bits prevented many insects though. I thought I saw some sort of large beetle larvae in there 8/98. On 8/22/98, I noticed a lot of mosquito larvae since I was out of mosquito dunks. The beetles apparently did not eat them. So, I put in 5 mosquito fish from my tub pond. I never saw them again except for one in early 10/98 that froze come winter. Perhaps the crows or raccoons ate them. Oh well, I had plenty. There were fewer mosquito larvae too. By 1/13/99, this pond had been frozen solid for a few weeks. On 7/12/99, a lone newly adult spotted salamander (from inside) was put in the pond a day after the pond had a total cleaning. The week before, the pond had been full but with no rain in months and thirsty deer, the pond was empty in under a week. By fall of 1999, there were no animals in this pond except a few young green frogs. The animals present in the pond varied day to day. There were mosquitoes, beetles, mosquito fish, young green frogs, and rat-tailed maggots (drone fly larvae) at various times. Deer drank from the pond regularly as did neighborhood dogs and cats. When I cleaned out the pond on 9/2/00, I removed two green frogs who had wandered over as well as a two-inch bronze goldfish; surprise! There must have been eggs on the parrot feather I put in. For 2001, I poured in some water from a local pond that was full of daphnia and tadpoles. I netted out daphnia every once in a while to feed to my fish elsewhere. The daphnia did really well there. I tossed in food every once in a while but I really did not know what they were eating! I shop vacuumed out the pond and replaced the mucky water on 10/14/01 and saw no daphnia left. Amazingly, in 2003, I discovered daphnia in the pond! I had shop vacuumed it out at least four times since I put them in and yet here they were; some had survived! In August, 2003, I put water hyacinth in this pond that happened to be full of goldfish eggs! I netted out 17 of them on 10/12/03 which I put into my basement pond until spring. All died so I stopped adding them since it was too shady and the deer ate them. On 9/5/98, I dumped in some of my excess salvinia and creeping primrose that I would have just dumped to die anyway. After that, I continued to dump my excess plants in there for the deer to munch. Any surviving plants died over winter when the pond froze solid. 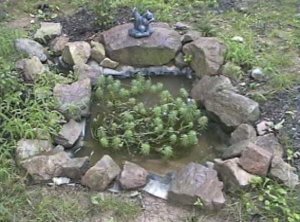 On 7/11/99, a ton of excess primrose creeper, a few anacharis, some parrot's feather, and a small piece of watercress were added to the pond to make the salamander added on 7/12/99 more comfortable. In 2000, I put in a bunch of parrot feather (with eggs apparently). I put nothing in for 2001 but should have. I shop vacuumed and refilled the pond on 8/4/02. Then, I added some excess water lettuce and one water hyacinth which the deer will eat. On 8/10/03, I filled the entire pond with excess water hyacinth and a few water lettuce. I did not put any plants in this pond in 2004 until 8/29/04 when I put in about a dozen water hyacinth. A whirligig beetle came along for the ride too. The deer ate most of the plants. There were a few baby green frogs back there. On 11/21/04, I vacuumed out and refilled the back pond and found no animals. I cleaned (shop vacuum) out this pond about two times a year. I did so on 4/29/07. 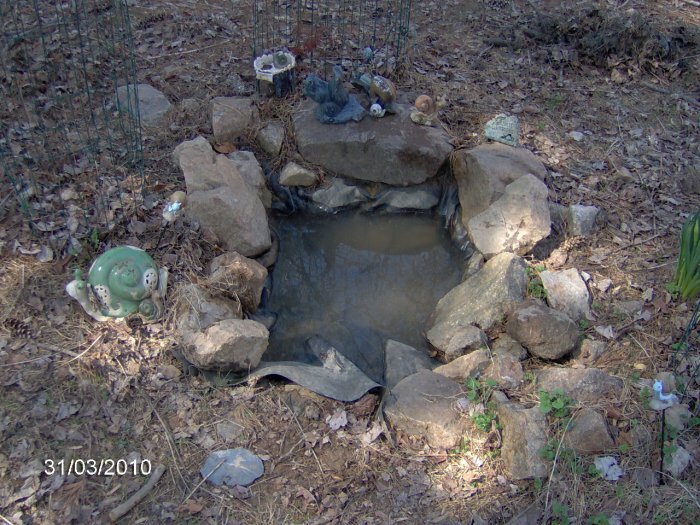 On 3/24/08, I cleaned out the back pond. It was full of 16 gallons of wet, stinky leaves. I used my bare hands to pick up that slop and toss it. Running three hoses and a 100 foot extension cord back there, I was able to rinse, vacuum, and repeat until it was sort of clean. I refilled the pond. The rocks had really collapsed in as had the liner over 11 years. I would redo the pond except it was so far from the house, and I let it "go wild" anyway, only cleaning it a few times a year. There were no plants or animals back there aside from whatever bugs might be there. 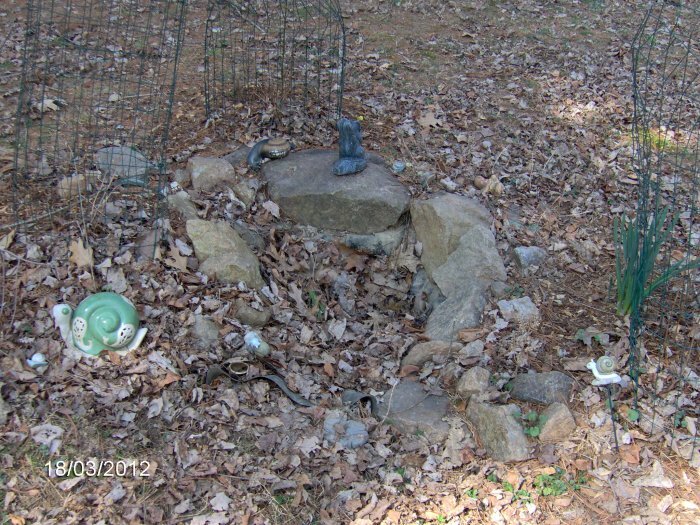 I cleaned out the back pond on 4/1/09. Ewwwwwwwwww! Ditto the above. I cleaned out the little pond on 3/31/10. I did not clean out the back pond again until 7/14/11! Boy was it dirty! I planned to replace it with a slightly larger pond, perhaps closer to the house last spring but it never happened. I have the liner, just no time and no help. I demolished this pond on 3/18/12. There was almost no water in it, just a lot of leaves. I pulled out the rocks and liner. I bought a new liner a few years ago and had to decide if and where I might build a replacement for this pond. At that time, there was a drought so digging was out anyway. I dug the new pond on 5/8/12 and used some of that dirt to fill in the hole where the old pond used to be. Picture of the little pond, taken on 11/6/97 with lots of leaves in it. Picture of this pond, taken 9/4/00 with parrot feather in it. 16 gallon liner pond - cleaned and re- filled on 3/31/10. 16 gallon liner pond - the day that I would dismantle it forever on 3/18/12. As you can see, there were really just a ton of leaves left in there.